Ramstein, the largest US Air Force base in Germany, is not only the headquarters of the United States Air Forces Europe, but also the central airlift hub for the European Theater and a North Atlantic Treaty Organization (NATO) installation. As the headquarters it exercises day-to-day command and control over all USAFE units from Great Britain to Turkey. As the airlift hub it operates a gigantic passenger terminal to rival the ones at commercial airports. And it soon is to be the home of a huge shopping/community center, right across the street from the new passenger center. The base, located in the federal state of Rheinland-Pfalz, opened in 1952 following construction under the provisions of a reciprocal agreement with France, which was then the occupying authority in this part of Germany. Rheinland-Pfalz, in the southwest corner of Germany, is the country's main wine growing region and also the location of its largest unbroken stretch of forest, the Pfalzerwald. The air base is part of the Kaiserslautern Military Community (KMC), home of more than 57,000 Americans and the largest American community outside of the U.S. Ramstein, Kapaun, Air Station and Vogelweh are the predominately Air Force communities within KMC. As a NATO installation, Ramstein has Canadian, German, British, French, Belgian, Polish, Czech, Norwegian, Danish and Dutch military personnel in addition to the Americans. The base's beginnings are colorful. Its construction came as no surprise to the local inhabitants who were no strangers to airpower. The Luftwaffe had converted a section of the local autobahn into an airstrip at the beginning of World War II. The advancing U.S. Army Air Forces also used the airstrip during the final months of the conflict. When it opened in 1952, the base served as the home for the 86th Fighter-Bomber Wing and its fleet of F-84F Thunderstreaks. For a while Ramstein was headquarters of the Seventeenth Air Force, but that headquarters moved to nearby Sembach Air Base in 1972 to make room for United States Air Forces in Europe (USAFE) Headquarters, which moved to Ramstein AB from Lindsay Air Station, Wiesbaden. Ramstein had a major change of mission in 1994, when it switched roles from a fighter base to an airlift one. The handling of passengers and cargo switched there from Rhein Main Air Base, making necessary the construction of the new passenger terminal. Features of it include automated luggage handling and passenger bridges for boarding planes right from the terminal. It also has air conditioning, dining and shopping facilities, a children's play area and a TV lounge. The host unit at Ramstein is the 86th Airlift Wing, whose commander also serves as the Kaiserslautern Military Community commander. For more information visit the base's website at www.ramstein.af.mil. Einsiederlerhof Air Station hosts the Warrior Preparation Center (WPC), a fully functional, computer-assisted war-gaming center, providing operational-level training and exercises to US and NATO staffs worldwide. The WPC was initiated and is directed by both USAFE and USAREUR. Another element of the Vogelweh complex is Kapaun Air Station, an Air Force facility. Among its units is the Kisling NCO Academy, which provides professional military education to Air Force NCOs. The school is fully accredited by the Southern Association of Colleges and each graduate earns 10 semester hours of college credit through the Community College of the Air Force. The school is named in honor the late Richard D. Kisling, who had a distinguished career as an Air Force NCO and rose to become Chief Master Sergeant of the Air Force. The Defense Commissary Agency also has its headquarters on Kapaun. The Air Force also has a number of facilities in Vogelweh. The Exchange Main Store at the KMCC has a large number of departments common to most large department stores in the USA. The KMCC itself is modeled after a large mall. A food court offers all your American favorites, such as Baskin Robbins ice cream, Subway, burgers, pizzas,Taco Bell, Starbucks and Cinnabon and also some new food fare including Chinese specialties, seafood, and a 50s Diner: Johnny Rockets. The Exchange Express stores are scattered throughout the KMC. You'll find them on the south side of Ramstein and at Kleber, Kapaun, Landstuhl, Pulaski and Sembach. Many are open longer than the Main BX. The Airman & Family Readiness Center (A&FRC) in Building 2120 offers services to personnel and their families through core programs that offer workshops, special events and one-on-one consultations. The programs include: Relocation Assistance - Established to make the move to your new base as smooth as possible. Transition Assistance - Available for active duty members, civil service employees and their family members who are separating from the military or civil service. Volunteers Resources - There are many opportunities for volunteers. Many are administrative or clerical. Volunteers may be able to be placed in their area of job interest to enhance their knowledge and skills in that particular area. Personal & Family Life Education - A practical approach to building and maintaining healthy relationships. Personal Personal Financial Management Program - A counselor can help prepare a personalized budget and spending plan. Assistance is also available in areas such as military pay and allowances, consumer rip-offs, savings, insurance, car buying, the financial aspects of home buying and credit card management. The Air Force Aid Society - The official charity of the Air Force, helps out in emergencies through interest-free loans or grants for basic needs such as emergency leave, medical emergencies, car repairs and respite childcare. Exceptional Family Member Program (EFMP) -A mandatory program for family members (child or adult) with any physical, emotional, developmental or intellectual disability that requires special treatment, therapy, education, training or counseling. Employment Assistance & Career Focus Programs Personal & Family Readiness Program - Offers a wide array of support services to military members and their families throughout the entire deployment process. The Arts & Crafts Center in Building 522 features a wood-craft area, frame shop, craft store, and engraving center. We also offer a variety of classes for adults and children. Monthly class schedules are available at the center and include ceramics, pottery, cake decorating, scrap booking, framing, and more. 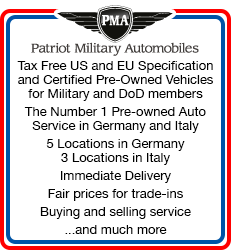 There are three Ramstein Automotive Centers: the Auto Annex, the Auto Hobby Shop and Auto Recycling. The Auto Hobby Shop offers self-help bays and lifts, a car wash and coin-operated vacuums. The Auto Annex provides professional mechanical diagnoses and repairs, performed by certified mechanics. The Auto Recycling offers vehicle disposal and parts pulling, along with a towing service. Full service Community Banks on Ramstein Air Base are located at the KMCC and in Building 2163. There is also a bank at the Vogelweh Commissary. ATMs are in the Base Commissary, the Officer's Club, the Enlisted Club, the North Post Office, the Food court at the KMCC and in the KMCC Hotel. Service Credit Unions are at the KMCC and in Building 2410 on Ramstein. The Child Development Centers provide weekly care for children ages six weeks to five years. There are also family day care programs at the homes of certified providers through Family Child Care (FCC). Hourly care is available on a limited basis. KMC Youth Instructional programs offer a wide variety of programs for youth and families. They offer classes in dance, gymnastics, martial arts, yoga, acting, musical instruments, singing and other special specialties. 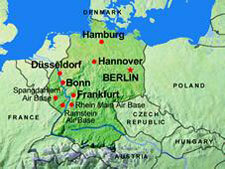 Classes are conducted on Ramstein Air Base (RAB) and the Vogelweh Military Complex (VMC) and class locations vary. The School Age Program provides before and after school care, camps during winter, spring and summer breaks and daily care for school holidays. Locations are on Ramstein, Vogelweh and Kapaun. The School Age Program is COA accredited. The Teen Centers offer a variety of activities ranging from video games, pool, ping-pong, real-2-real, dances and lock-ins. There are also clubs that young adults can join. The Centers are on Ramstein AB in Building 411 and at Vogelweh Building 2059. The Youth Centers sponsor many events and offer a wide range of programs for kids and families. Sports programs are a big part of the offerings. Both Centers have their own gymnasium. Another part is a number of after school clubs. The Youth Centers are in Building 428 on Ramstein and Building 1057 in Vogelweh. Youth Sports Programs operates sports and fitness programs for organized seasonal sports such as football, soccer, baseball, softball, basketball, swimming and cheerleading. For those seeking civil service employment in the area and other jobs. Located in Building 2120. The Defense Commissary Agency Europe (DeCA) is headquartered at Kapaun Air Station in Kaiserslautern, and two of the biggest commissaries under its control are at Ramstein and Vogelweh. Both stores are seven-day operations with ample shopping space and numerous checkouts, including four self-checkouts. They each have an ATM, bakery, deli, fresh sandwiches to go, hot foods department, party cakes, plants, rotisserie chicken and a salad bar. There is a smaller commissary on Sembach Kaserne open Monday - Friday. There is no lack of eateries and great entertainment on Ramstein Air Base, in addition to the Food Court and other restaurants in and near the KMCC. Romano's' Macaroni Grill is a top notch Italian restaurant open 7 days a week and located inside the KMCC. The Enlisted Club in Building 2140 has a Chili's, the E' Street Café on base and at Vogelweh Crossroads. There is a J.R. Rockers Sports Café in the Club. The Enlisted Club also has rooms and a full catering menu available for special occasions or ceremonies. Reflections is equipped with over 70 entertainment machines and a full service bar as well as food served from J.R. Rockers. The Wi-Fi Lounge is a private area downstairs with free Internet access. Karaoke, Football Madness, poker tournaments and other great activities are on tap at the club. It is also the location of the Tadros Shop that offers home décor items, paintings, mirrors and other products. The Officer's Club in Building 302 is a multi-facility dining and entertainment complex. It has The La Casa Dolce Coffee Shop and the Wings Lounge. There is a daily lunch buffet in the Rheinland-Pfalz Dining Room. The Club hosts the Lifestyle and More Vinothek. It offers professional catering for functions and events and has a gaming room. Military Dining Facilities include the Rhineland Inn (Building 2107), the Jawbone Flight Kitchen (Building 3332, next to the Passenger Terminal) and the Lindberg Hof (Building 2791 on Kapaun). The Community Centers on Ramstein and in Vogleweh also offer food. The Flying Pig Barbeque and the Pizza Gallerie are both located there. The Woodlawn Grill "On the Greens" is the restaurant at the golf course. It specializes in quick grill items and soups salads and is open for breakfast and lunch. Both the Bowling Centers at Ramstein and Vogelweh have snack bars - the Open Frame at Ramstein and a Subway at Vogelweh. The NATO International Dining Facility (Building 313) is accessible to all U.S. military, dependent and retired ID card holders, and to all personnel with a valid installation pass. The facility is open from 11:30 AM to 1 PM Mondays through Fridays and offers three different meals each day along with a salad bar. The coffee bar is open from 8 to 11:30 AM and from 1 to 2:30 PM. The Deutsches Haus restaurant is on the ground floor of building 544 on Ramstein Air Base. It is operated by the German element of NATO on base and offers a variety of German fare. It's open for lunch and dinner Monday - Thursday and for lunch on Fridays. First-class community centers in Ramstein and Vogelweh offer a relaxed atmosphere featuring tournaments in pool, table tennis and chess, special events, television rooms and much more. Musical equipment, games and other items can also be checked out for use in the centers. Concert tickets are sold and one-day tours are also organized. There are also murder mystery dinners and theater performances. Language classes are available, too. Services offered also include sending and receiving Faxes, table and chair rentals for private functions, mailbox rental and free computer and Wi-Fi access. On Ramstein there is Celebrations - a Balloon and Gift shop. MOMS Movies and Music has outlets on Ramstein and Vogelweh. Just about everything for your for entertainment needs is available. MOMS is an all-in-one stop shop for pictures, movies, instruments, and navigational systems. There are weekly new movie releases and Wednesday rental specials. MOMS also offers special DVD/Blu-ray movie ordering. The Ramstein location has a photo lab for official photo processing, passport photos, photo restoration and digital photo processing. The Ramstein Education Center is located in Building 2120. There are counselors to assist local Air Force members, civilian personnel and families with their educational needs. Several colleges and universities offer a variety of undergraduate and graduate degree programs. They include: Central Texas College, University of Maryland, University of Oklahoma, University of Phoenix and Embry-Riddle Aeronautical University. Representatives of these schools normally have offices in the Education Center. American Red Cross offices provide an Emergency Communications Service 24/7/365 for active duty, family members and civilians and their families. There are emergency relief services available through the Airman and Family Readiness Center on Ramstein. Although many medical specialties are available at the Ramstein Medical Treatment Facility (Building 2114), all in-patient care is at Landstuhl Regional Medical Center (15 minutes away). A clinic provides dental care for non-flying military members and their families. Dental care for family members is limited because of space limits and the needs of the active duty population. 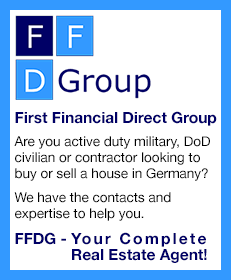 Family housing is available on Ramstein AB and in Vogelweh. Depending on rank, neighborhood preference and number of dependents, housing will consist of two to four bedroom stairwell apartments and/or townhouses. There are also off-post housing opportunities. Check with the Housing Office for details on availability. The housing office for the KMC is located in Building 1001 at Vogelweh. Customer Service hours are Monday through Thursday 8 a.m. to 3:30 p.m., Friday 8 a.m. to 2:00 p.m. The Ramstein Legal Office staff provides free legal assistance to service members, Department of Defense civilian employees assigned overseas, Department of Defense Contractors who have "SOFA status," and their dependents. It is located in Building 2137. The Ramstein and Vogelweh Libraries offer an extensive array of materials and resources to include the latest bestsellers, periodicals, newspapers, journals, CDs and DVDs. The Ramstein Library has over 70,000 books and subscriptions to over 100 newspapers and magazines, while the Vogelweh Library offers an inventory of over 10,000 books. The libraries also have computers and printers and offer free Wi-FI with high speed Internet access. The Ramstein Inn has two facilities on the base - the General Cannon Hotel (Building 1018) with 12 distinguished visitor/business suites, and Ramstein Inns-Ramstein with 1,050 rooms. These include VQ, DVQ, temporary lodging facilities and pet-friendly temporary lodging. The facilities are in 20 buildings throughout the base. Other Ramstein facilities are at Vogelweh and Landstuhl. There are three Air Force postal facilities in the KMC. Ramstein North Side Post Office (Building 426), Ramstein South Side Post Office (Building 2110) and the Kapaun Air Station Post Office (Building 2763). Ramstein's Woodlawn Golf Course is an 18-hole championship course that ranks with the very best in Germany, and membership rates are reasonable. RTT Travel is a full-service leisure travel agency. It is located at the KMCC and open Monday - Saturday. The Skate Express offers open skating for all ages. In addition, it has a snack bar, video games and equipment sales and rental. Ramstein Outdoor Recreation Center is at the KMCC (Building 3336). Its retail operation offers a large selection of outdoor clothing and equipment as well as bikes and equipment, camping gear, fitness apparel and snowboarding and skiing gear. Rental equipment is also available. You can book hiking, biking ski and snowboard trips and tours. There is a rock- climbing wall, too! The Ramstein Bowling Center (Building 2139) has 32 lanes, a pro shop and slot machine game room as well as a snack bar. It is open seven days a week. The Crossroads Skating Rink is across from the Commissary at Vogelweh. It was recently renovated and upgraded. Skate rentals are available. There is an E' Street Café and DJ Station. Private conference rooms are available. There are KMC Air Force Chapels on Ramstein AB. The North Chapel is in Building 1201 and the South Chapel is in Building 2403. There are chapels in Vogelweh (Building 2063) and on Kapaun Air Station (Buildings 2781/2782). They offer not only Catholic and Protestant services, but also other services including Jewish, Islamic and other denominations. All schools are located near government housing areas. The school your children attend will depend on where you live, not where you work. Students who live on base walk to school; all others ride the bus. Government-contracted buses provide school bus transportation. It is recommended that before you rent quarters on the economy you check with the housing office to determine if the residence is along an established school bus route. Sports enthusiasts have three Fitness Centers available, each with a basketball court, weight lifting rooms, cardio equipment, saunas, locker and shower facilities for men and women and racquetball courts and other amenities and activities. The Ramstein Aquatic Center has 3 indoor pools - a 25-meter fitness pool with lap lanes and diving board, a wading pool and a recreation pool with water slides and a playground. Various programs are offered as well as SCUBA classes. It is in Building 422 on Ramstein and open 6 days a week (closed on Mondays). A full range of intramural and base-level sports programs are offered. The Gear Up Sports Store provides clothing, shoes and accessories for many sports. It is in Building 2113 on Ramstein. VAT (Mehrwertsteuer) relief forms can be processed on Ramstein AB at Building 2108. Spangdahlem Air Base is located about 20 miles northeast of the city of Trier in the southwest section of Germany along the borders with Belgium, Luxembourg and France. The Bitburg Annex, which adds to base space and facilities, is located about 10 miles from Spangdahlem in the city of Bitburg. The local area is primarily agricultural, and its most famous products, to the delight of imbibers, are beer and Mosel wine. Spangdahlem is a small village, but the larger cities of Wittlich, Trier and Bitburg are close by. It is close to the Nürburgring, a Mecca for motor sport enthusiasts. The climate is generally cool with light rain and fog common. The temperature range in winter stays close to freezing, while summer temperatures hover between the 60s and the upper 70s. The area is the home of one of Germany's most famous beers. The Bitburger Brauerei is the region's largest employer with 200 years of tradition. It is one of the country's three largest breweries. For more information on Spangdahlem visit the website at www.spangdahlem.af.mil. The Airman & Family Readiness Center (A&FRC's) primary focus is to support readiness by helping families and single military members adapt to the demands of Air Force life and to assist commanders in responding to identified concern and issues. The center designs, develops and conducts quality of life programs according to base and community needs and capabilities. The whole region is a "sportsman's paradise" with activities in Luxembourg, Belgium, Holland and France, all of them less than two hours from your doorstep. Outdoor Recreation at Spangdahlem offers rock climbing and rappelling, sea kayaking, downhill and cross country skiing, deep sea fishing, scuba diving, snowshoeing, mountain and trail bicycling, river rafting, river canoeing, weekend camping and hiking. It also offers equipment rental for a large variety of camping and sporting activities. The Skelton Memorial Fitness Center is very large and serves the Eifel community from two locations, one at Bitburg and one at Spangdahlem. It has a gym, nautilus equipment, free weights, racquetball courts, lifecycles, Stairmasters, rowing machines, saunas, a jacuzzi, aerobics, intramural sports programs and recreation leagues. The base also has outdoor tennis courts, a nature trail and a track. Music & Video Xpress is a specialty store offering video rental and used books at the Bookmart. It also offers musical instruments; guitars, band and DJ equipment from picks to pedals and a whole lot more. The Eifel Line concessionaire offers computers and satellite equipment including custom built computers, software lines and hardware upgrades. They also offer a large selection of satellite receivers and decoders. The Eifel Mountain Golf Course at Spangdahlem is a challenging nine-hole course that also offers club and cart rentals, a pro-shop, a great snack bar, chipping and putting greens, summer junior golf programs, monthly tournaments, ladies golf league, golf lessons and a handicapping program. Whether you are a seasoned bowler, a complete novice or just interested in having a good time, the Eifel Lanes Bowing Center has much to offer. It's the place for special events, good food and a fun and exciting atmosphere. If you like to show off your skills as a competitive bowler, join one of the many intramural leagues. The Base Education Center's programs include: Professional Military Education, Community College of the Air Force, professional examinations (GRE, GMAT, etc. ), financial aid information and commissioning programs. Degree programs are offered from the University of Oklahoma, the University of Maryland, Central Texas College, the University of Phoenix and Embry-Riddle Aeronautical University. DODDS operates schools at Spangdahlem and the Bitburg Annex. The High School, located only at the Bitburg Annex, is for grades 9-12. The elementary schools are for grades K-4 and the middle schools are for grades 5-8. Americans can use the local German schools; however German language skills are needed beyond kindergarten. German kindergartens are the most frequently used of all the German programs by Americans. The older the child, the more German language skills are necessary. The 52nd Medical Group consists of aerospace medicine, dental, medical operations and medical support squadrons providing services split between Spangdahlem AB and Bitburg Annex. The medical group operates an outpatient clinic at Spangdahlem AB that includes family practice, pediatrics, women's health, psychiatry, aerospace medicine and optometry with exceptional clinical laboratory, radiology, pharmacy and physical therapy support. The 52nd Medical Group hospital, located on Bitburg Annex, provides emergency, obstetrics, gynecology and various surgical services. Group dental services include general dentistry, oral surgery, periodontics, orthodontics and prosthodontics. There is a strong partnership with community hospitals. There is one veterinarian for the base, as well as a number of veterinarians in the local area. The base veterinarian is only available during duty hours. For after hour emergencies you will need to contact a local veterinarian for assistance. The veterinarian clinic and Pet Spa have a list of local veterinarians. There are two chapels to serve the community, one on the main base and one at the Bitburg Annex, offering a variety of worship services for Roman Catholic and Protestant denominations. There are also worship services off base in which the community is welcome to participate. Red Cross services on base include emergency notification/verification of death or sudden illness, birth announcements and health and welfare reports. The Eifel Teen Center is located at the Bitburg Annex within easy walking distance from both the Middle and High Schools. The teen center is one of the largest in the Air Force and boasts a snack bar, large game room, technology center and Internet gaming center. In addition there is a dance hall and meeting center in the facility. The center is open Monday to Thursday from 1500-2000, Friday from 1500-2230 and Saturday from 1700-2230. A variety of programs, trips and events are guaranteed to keep your teens busy. Facilities at Spangdahlm and Bitburg include a Shoppette, a Class Six store, video rental, military clothing sales store, Burger King, Anthony's Pizzas, Subway, Cinnabon, Charley's Steakery, Baskins Robbins, Gas Station, Barber and Beauty Shop, Photo Express, alterations shop, Car Care Center, car rentals, new car sales, Service Mart (dry cleaners), flower shop and the Castle snd Skyline theaters. Commissaries are located at both Spangdahlem and Bitburg, offering a variety of grocery and produce items as well as a bakery, deli and houseplants. The Club Eifel combined club at Spangdahlem offers several unique dining opportunities including a Pizza Hut and daily lunch buffets from 11 a.m.-1 p.m. featuring themed menus including the very popular Wednesday Italian buffets. JR Rockers Sports Café offers great food and a warm family atmosphere with food and drink specials. The Club offers evening programs four nights per week in the Enlisted Lounge and every Friday in the Officer's Lounge. Try the Family Fun Night every Thursday night. Win big at the slots or play one of the many amusement machines for fun. You can't afford not to be a member of Club Eifel. The Community Center at Spangdahlem has a very active Community Theatre Group (Act Eifel). Also available for your convenience in the Center are several concessionaires to include Hertz car rental, Sebastiani's wines and Toni's gift shop. An exciting entertainment center, The Brick House, is also a part of the Community Center and is open daily from 1600- 2400, and until 2 am on Friday and Saturday. Come check out the state of the art AV systems: 100-inch projection TV screens, 50-inch projection TVs, 21-inch TVs; full DJ audio; karaoke; satellite, DVD and VCR playback with Dolby 5.1 Surround. Also for your entertainment pleasure are X-Box systems configured on-line for multi-player and Internet gaming, billiards, foosball, air hockey, dome hockey, putting green, darts, ping-pong, shuffleboard, and a snack bar if you are hungry. The Skills Development Center on Spangdahlem features a Crafts & Party Central retail sales outlet, (located in the Community Center), a custom frame shop, wood hobby shop and an engraving shop that offers plaques, T-shirts, mugs and embroidery services. Framing classes are conducted at Spangdahlem, and various arts and crafts classes are offered at both Bitburg and Spangdahlem. The Auto Hobby Centers provide you with high-tech automotive maintenance machinery, tools, supplies and work bays, coupled with well-trained mechanics on stand-by to assist you in vehicle maintenance or repair. Information, Tickets and Travel (ITT), located in the basement of the Community Center, offers full leisure travel services, including airline tickets, package tours and cruises. Accompanied members may choose to live in government-controlled quarters or may live in the community. Both Spangdahlem and the Bitburg annex housing are set up as stairwell units. For two and three bedroom units, the wait is 30 days or less. For four bedroom units, the wait is approximately 45 days. Unaccompanied E4s with less than three years of service must report to Central Dormitory Management. SSgt selects and E4s with over three years of service will be living off base and can only stay in the dorms if space is available. The Eifel Arms Inn at Spangdahlem is open 24 hours a day, seven days a week. AB Geilenkirchen is a North Atlantic Treaty Organization base, not a USAF installation, and is part of a military complex that also includes JFC Brunssum and the U.S. Army Garrison Schinnen, both a short distance across the border in the Netherlands. The base is located in Teveren, Germany approximately four kilometers west of the town of Geilenkirchen in the tri-border region of Germany, the Netherlands and Belgium. The NATO Airborne Early Warning & Control Force (NAEW&CFF) was created in January l980. On l7 October l980, NATO's Defense Planning Committee granted the command full status as a NATO headquarters. It is co-located with the Supreme Headquarters Allied Powers Europe (SHAPE), Belgium. Executive agent for the program is the Supreme Allied Commander Europe (SACEUR). The Component consists of approximately 3,100 multinational military and civilian personnel from 15 nations (Belgium, Canada, Denmark, Germany, Greece, Hungary, Italy, Luxembourg, the Netherlands, Norway, Poland, Portugal, Turkey and the USA). The Component's mission is to provide aircraft and trained aircrews to deliver a surveillance and/or control platform wherever and whenever directed by the NAEW&CF commander on behalf of the three major commanders. Sports and Recreation falls under the Morale and Welfare Activities (MWA) Branch. It is responsible for the following areas: Sports Department, International Youth Activities, International Library, International Pre-School, Thrift Store and Clubs. The Morale and Welfare Activities Branch, which falls under the Component Services Squadron, is responsible for all MWR-related activities. The Component clubs/societies available are as follows: swimming, ski, rod and gun, scuba diving, tennis, karate, line dancing, golf, and motorcycle riding. An outdoor swimming pool is available but only during the summer season, which runs from May through September. The Sports Department offers a variety of sports locations to include two gymnasiums, cardio room, weight room, indoor basketball courts, indoor/outdoor volleyball courts, baseball/softball fields, outdoor track and field, running trails, squash courts, outdoor tennis courts, racquetball courts, soccer field, outdoor swimming pool, sauna whirlpool, and sunbeds. There are special events going on every month. The clinic provides limited outpatient care. No emergency room is available. Personnel living on the economy use the German or Dutch EMS system. Patients requiring evaluation or treatment beyond the capability of the clinic are referred to other U.S. military facilities in Europe or to doctors on the economy. There is no quarantine for pets; however, they are not allowed in some guesthouses or hotels. Please inform your sponsor if you will be bringing pets. They must have rabies shots and certificates of health 30 days prior to but not more than one year prior to issuance of the health certificate. Importation of certain dogs is strictly prohibited. There is very limited military veterinary access provided; however, most local veterinarians provide similar services to US veterinarian offices and most speak English too. The Geilenkirchen American School provides educational opportunities for children from kindergarten through sixth grade. AFNORTH International Junior High and High School, about 15 kilometers away in The Netherlands, offers education for family members of all personnel stationed at JFC Brunssum, Geilenkirchen and Schinnen. The school caters to American, Canadian, British, Dutch and German students. Bus service is provided to students attending either school. The Component International Pre-School predominately operates on American guidelines. Priority is given to Component members (military or civilian). The school aims to prepare children of different nationalities, language levels and social skills for Kindergarten or any other form of further education in their home country. Services offered at the Chapel include Catholic Mass, Protestant and Jewish services and religious, marital and pre-marital counseling. There are also Bible studies, choirs, a women's group, a men's group, a youth group and crafts. It is not unusual for American families to become affiliated with churches within their villages. There is a Component International Youth Activities (IYA) Program, which offers After School Care, Special Day or Break, and Full Day activities for children 6-12 years old. It provides numerous youth teams, with help from base volunteers, for friendly competition with other local teams in soccer and baseball. Special instructional classes and family trips are also offered aside from the normal IYA programs. The Canadian-operated NATEX shopping facilities are similar to a small BX. The base also has a dry cleaner, a gas station and an auto service center with a selection of car parts and tires. These are mainly European stock, but quite a few Americans end up driving European spec cars anyway. And there is an AAFES Garage at Schinnen in the Netherlands (approx 25 minutes), that does carry American spec parts, tires and other car care items. There is also an auto hobby shop at JFC Brunssum. The nearest AAFES facility, at Schinnen, has a much more extensive selection of goods, and a number of concessionaires. The NATEX Grocery Store offers a wide variety of German, Canadian, U.S. and other European food products. The nearest US commissary is at Schinnen. The Thrift Shop sells or buys used household items, clothes, recreational equipment, books, jewelry and the like at very low prices. Clubs offer bars, slot machines and dining facilities with a wide selection of fast food items like pizza, soup, chicken and, of course, German cuisine. You can order your food to go. Family brunch is served every Sunday. Its location alternates between the Officers Club and the Frisbee (Enlisted) Club. The Component International Dining Hall is open to Component members (all ranks) only. Military and civilian personnel on official business at the Component may also eat at this establishment with prior approval. It serves over 800 meals a day in addition to flight meals for mission crews. No takeouts are available. The Component International Library is completely supplied through the USAFE Central Library System. Its collection consists of books, magazines, 10 language categories, audio/video tapes, music cds, DvD movies and the McNaughton Book Collection. There is another library at JFC Brunssum. There is one automatic teller machine on base, at Dresdner Bank. This machine can access Cirrus, Plus, American Express, Master Card and Visa. If you open a base German bank account, you can get dollars, euros and other currencies. You can make deposits at Dresdner in U.S. dollars and cash checks at Finance Services for dollars or euros. Geilenkirchen has a small AAFES military clothing store with a few amenities such as toiletries, movies, electronics and magazines. There is a theater and an arts and crafts center at JFC Brunssum and a BX at Schinnen. Most personnel live off base. Billeting is mainly for single military, though others may be accommodated on a space available basis. There are shared bathrooms and no television or telephones. For these reasons these quarters are not recommended for long periods. Single personnel also have the option of staying off base in hotels or guesthouses.